7.00 am I still can smell the screen cleaner stench that surrounds my computer, but there is no time to throw up now. 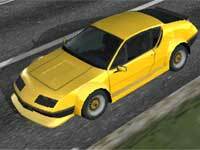 After watching the racer intro for the millionth time, I select the Alpine Renault A310 V6 made by Beni C with an ini from cubits. I know, it's not a brand new racer car, but I just feel like testing it. Why?, you ask , well I have never really driven this car in racer before. It just makes me want to sing: 'I'm not a virgin' ah ah 'driving this for the very first time .. I'm not a virgin ..your accelerator pedal close to mine. ' Well enough of that nonsense let's drive. Let's start by looking at this car, well it's a matter of taste but I think that it looks like an 80's ricer wannabe, with a love for cheap black plastic. Fortunately it's not about the car's looks, but the accuracy of the car's looks. There is no denying that Beni C did a good job. It could use some more poly's on some spots though, in the fenders and behind the ide window for instance. Besides that it's good looking and it's still a beta, so I won't say anything about the missing driver or steering wheel (but I think I just did). There isn't much to say about the textures really, they are good, but could use some more shading. 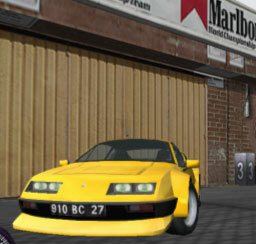 7.15 am I start the car, but what is this, I didn't know that there where Alpine Renault's with American v8's. Ah well you never stop learning eh. I don't know if the car.ini is realistic (I think that it slides to much, but that could be a racer bug), but it sure is fun to drive. It's always refreshing to go sideways through a corner. Some people might not agree with me, but a game is still about having fun, whether it's realistic or not. Cubits is becoming a ini wiz kid, let's hope that he will keep making ini's for a long time to come. - Textures could use some shading. Overall conclusion: It's a good quality car but it's not fantastic, but it has the potential, it just needs some work. 8.00 am I remembered something, something so important it reaches beyond the universe''..I have time to throw up now. All cars, tracks, reviews, articles & tools are © they respective authors Page created in 0.017 seconds.